NaCl – This compound, commonly called salt, is probably the most common deicer due to its availability and low cost. Salt lowers the freezing point of water which aids in melting of the snow and the inability of it to refreeze. Unfortunately, salt is not good for water streams (that forms our drinking water), vegetation, and is corrosive, destroying metal on cars and buildings. Ogden Snow Removal can, however, use a sugar beet by-product that reduces this corrosive property by two-thirds according to a recent study. CaCl2 – Calcium Chloride is also a salt that works effectively in temperatures as low as minus-52 degrees Celsius. This type of salt is exothermic, produces heat when reacting, so it works must faster at melting ice and snow. However, CaCl2 leaves precipitation that remains moist and may refreeze if surrounding temperatures do not elevate. Like all salts, Calcium Chloride can be corrosive. Ask for the sugar beet solution today! MgCl2 – Magnesium Chloride has many of the same capabilities as CaCl2 including exothermic properties and low freezing point. This compound’s effectiveness is less than CaCl2 but greater than NaCl, making it an easy alternative to balance the harmful effects of using salt. Any of these compounds can be applied before snowfall to prevent formation of ice, called anti-icing. This is especially helpful on commercial properties where your customer’s safety is imperative or heavily used walkways or driveways in your neighborhood. Because anti-icing prevents the instance of water freezing on a surface, it proves to be much safer and more efficient at removing ice than de-icing. Nonetheless, de-icing is a great follow up treatment to ensure that roads and pathways are not slick. Death by Icicle – sounds like a great non-fiction story but the truth is, this phenomenon is real! About 15 people die each year due to falling icicles. Sure icicles are one of the many great natural architectures of our world, but just like flat ice, they can be dangerous. 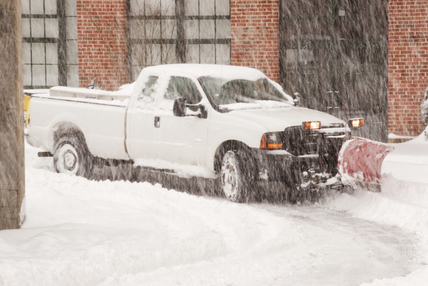 At Ogden Snow Removal, we also provide icicle removal and de-icing/anti-icing of roofs, gutters and tall surfaces where gravity can pull down freezing water. Up the ante on safety with deicing in Ogden by giving us a call today: 801-658-9343.